Surrey Libraries' Chatterbooks: Chatterbooks Stories for Libraries Week are Published! 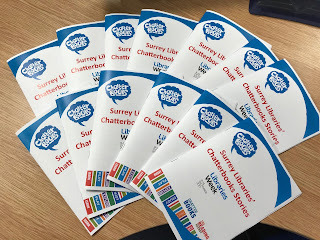 Chatterbooks Stories for Libraries Week are Published! To celebrate Libraries Week 2017, all of our Chatterbooks groups turned their hands to creative writing and, working together, have created four amazing stories. Four groups (Dittons, Guildford, Woking and Redhill) were each given the same opening to a story, and each group took the story off in their own direction. They then passed their story openings on to Chertsey, Cranleigh, Dorking and Reigate groups, who developed them further and sent them on their way to Egham, Haslemere and Caterham Valley. Finally, children at Shepperton, Staines, Reigate and Woking brought the four stories to a conclusion. The resulting stories are brilliant - full of imagination, creativity, fantastic characters, humour and surprising twists and turns. Huge thanks to everyone who took part in the project, and to Anna Molesworth, Jackie and Ellie Nobes and Richard O'Mahoney for the illustrations that brought the stories to life on the page. Click here to read the stories - we hope you enjoy reading them as much as the children enjoyed writing them.